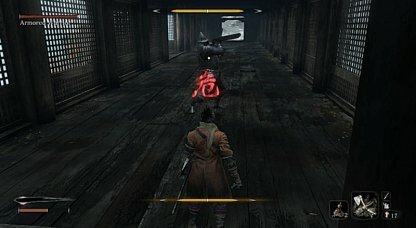 Check out this Sekiro: Shadows Die Twice guide on how to beat Armored Warrior. Info includes gameplay tips, recommended Prosthetic Tools & Items, boss moves and attacks. 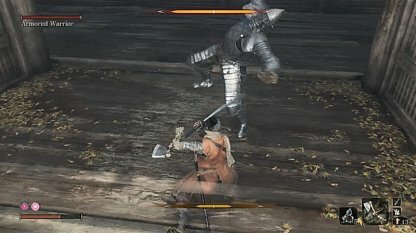 This skill lets you recover Posture when you deal a Deathblow. 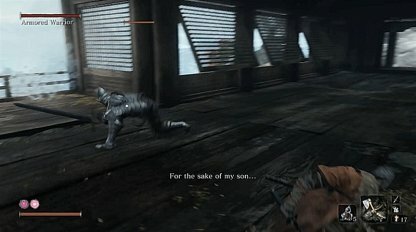 This is a useful skill to have when dealing with many enemies in one area. Check Out All Skill Tree List Here! 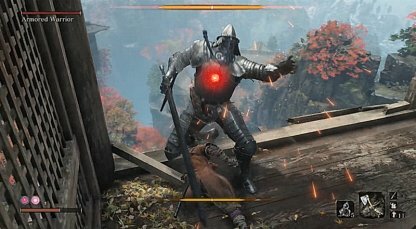 The Loaded Axe helps in dealing posture damage to the Armored Warrior. 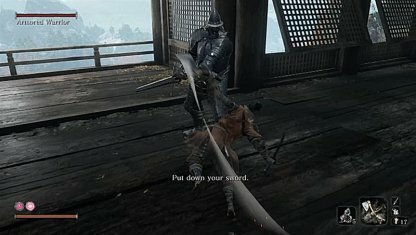 Use the Loaded Axe when he recovers from attacks as his recovery time is quite slow. 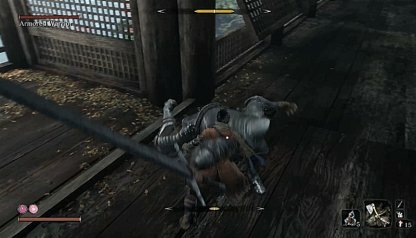 This fight is unique in that the Armored Warrior cannot be killed, even with a standard deathblow. 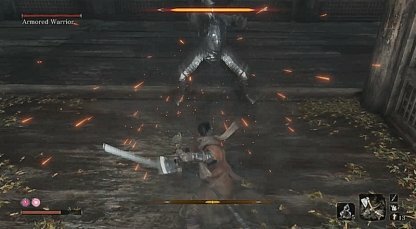 You need to perform the deathblow with his back against the ledge to kill him. You must lure him to the ledge and have him destroy the rails first. 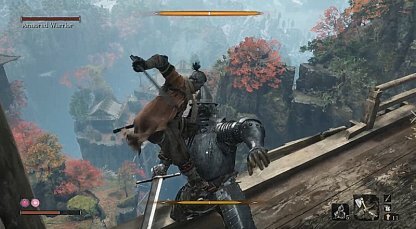 This opens up the ledge for you to push over with a deathblow. 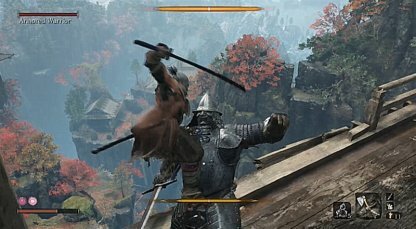 His attacks are slow and can be parried easily. Use this to deal posture damage, but keep watch on your own posture as well as his attacks are heavy if parries are not timed correctly. Check Out Posture System Explained Here! After successful parries, or after a series of swings, Armored Warrior takes quite a while to recover. Use this opportunity to use your Loaded Axe. 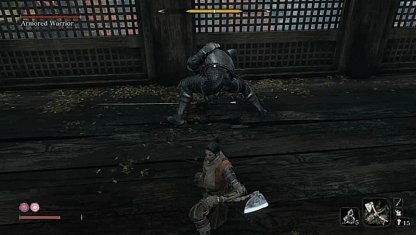 Once you've dealt enough posture damage, perform a deathblow with his back against the ledge. The Deathblow will push him off and he will plunge to his death. 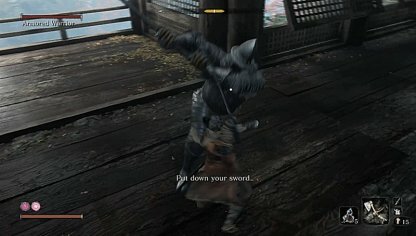 You can parry this move as he swings his sword. Interrupt his succeeding attacks with a quick counter attack. He will enrage and swing his sword violently four times, with the fourth strike being a powerful overhead swing. 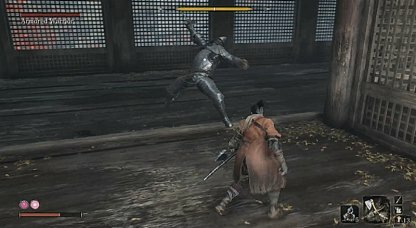 Successfully parrying the fourth attack will stagger him. Instead of raging, he will rush to you to close the distance and perform the barrage attack. 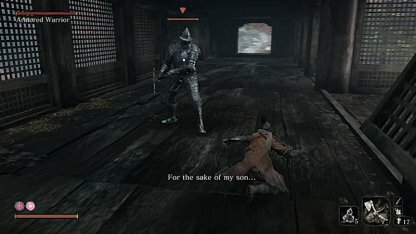 Parry all of his attacks to deal posture damage and to stagger him. A strong piercing perilous attack which can be countered with a Mikiri counter. If uncomfortable to perform a Mikiri Counter, dodge to the side. Check Out Best Abilities & Skills to Unlock Here!